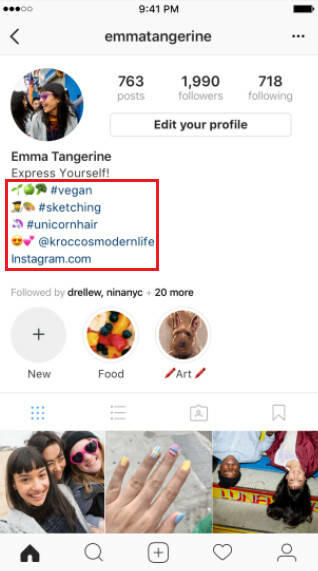 Instagram announced today that it will now allow subscribers to add hashtag and profile links to their bios. The live links will take Instagram users to a hashtag page or to another subscriber's profile. Adding a hashtag or profile link is a snap. Tap on Edit Profile and go to the section marked "bio." Type in a "#" or an "@" and you will see a list of recommended hashtags and profiles. Select the ones you want to highlight in your bio, and as we said, they become live links. With the new feature, Instagram subscribers can link to any hashtag or profile that they want to. Keep in mind however, that those Instagram account holders whose profile you mention in your bio will receive a notification that you are linking to them. They can decide to opt out, which will keep their "@" profile name in your bio, but it will no longer link to their Instagram account. But can't bring back chronological order. These guys are a joke. Ignore what users keep asking for and add a bunch of features just because.